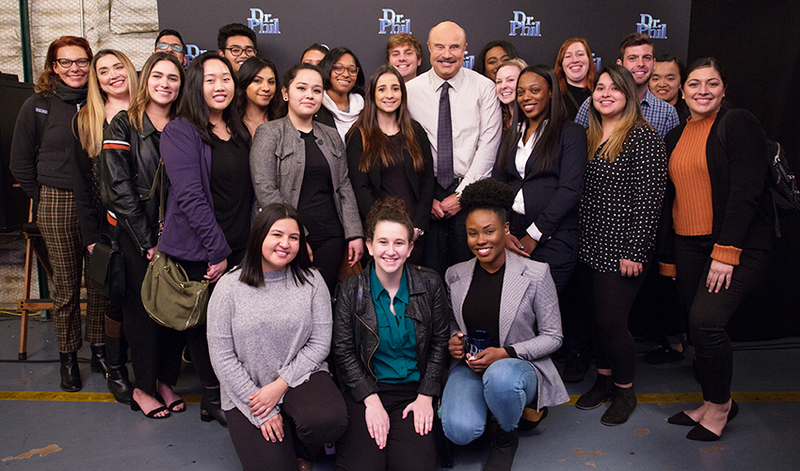 Dr. Phil McGraw with his show’s interns and staff, many of whom are SF State alum and students. An intern on a daily TV show has to be ready for anything. Technical glitches. Last-minute script changes. Guest no-shows. Blue hair. Yes, blue hair (or blue anything) can be a problem for TV shows that use a blue or green screen to superimpose desired background scenes, as anything in those hues captured on camera would, in effect, disappear. So when a guest scheduled for the number-one daytime talk show in the nation, “Dr. Phil,” unexpectedly dyed her hair blue right before her appearance, an intern was dispatched to find a quick cover-up. Which is how San Francisco State University senior Tyler McKinney ended up racing frantically through the aisles of a Los Angeles wig store phone in hand. As they say, the show must go on. McKinney is one in a long line of San Francisco State students who’ve gained hands-on experience and industry connections through an internship course offered by the University’s Department of Broadcast and Electronic Communication Arts (BECA). Available every spring semester, the class — BECA 395: “Close-up on Los Angeles” — is taught by BECA Associate Professor Miriam Smith. Smith created the one-unit course more than 10 years ago with the hope that it would smooth the path to post-graduation employment for BECA students. Carla Pennington, BECA alum and Executive Producer of "Dr. Phil." Smith takes the class on a trip to Los Angeles to rub elbows with industry bigwigs and established BECA alumni, building relationships that could lead to that all-important first gig. That’s what happened for alumna Jodi Sanders. Three years ago, as a student in the internship course, she was a “Dr. Phil” intern. Today she not only serves as the show’s Executive Production Coordinator, she also manages the very internship program that got her foot in the door. Currently, seven of the show’s 10 interns are San Francisco State students or recent graduates. Sanders says due to the work ethic and drive exhibited by her fellow Gators, a majority of those interns will move into full-time positions, eventually becoming production assistants, transcriptionists, graphic artists and even associate producers. Nicole Segura, another recent BECA graduate, says that before attending SF State she didn’t know what she wanted to do with her life. Her “Dr. Phil” internship helped show her the way: Like Volf, she’s now a full-time Production Assistant on the show. One of those fellow alumni is Carla Pennington. A 1985 SF State graduate, she’s currently Executive Producer of “Dr. Phil” and several other CBS programs. She says she remembers how helpful internship opportunities were for her as a student, which is why extending a hand to those still climbing the ladder is important to her.